Over the weekend, the social nightlife app Nightlife Dallas shared a stunning nightscape image on its official Instagram and Twitter accounts. Photographed and originally shared by Museum Tower Dallas on Instagram, the image features a scene that is our residents' reality--a dazzling, panoramic view of Dallas from a private balcony high above the city. 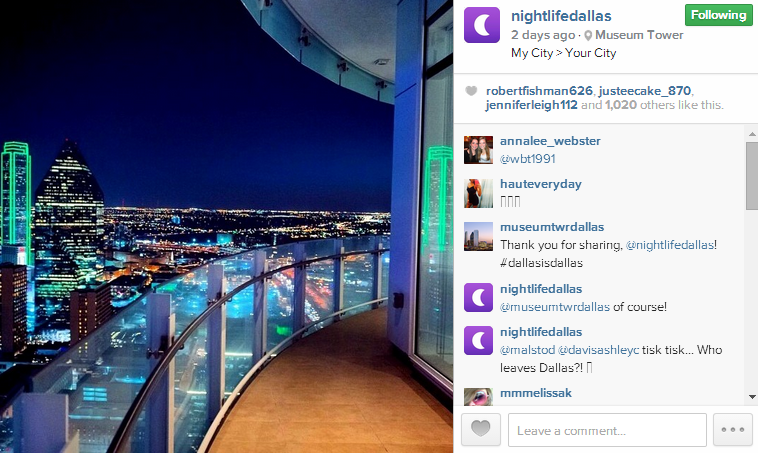 @NightlifeDallas shared the image to an impressive follower base that edges over 14,000 users on Instagram. More than 1,200 users showed their admiration by liking the post. Using the same words to caption the post, "My City > Your City," the image was retweeted and favorited nearly 50 times on Twitter. Many thanks to Nightlife Dallas for sharing this post.